Implementation: Chicago is the largest city in the United States to commit to 100% renewable energy. Located on the shores of Lake Michigan, it is an international hub for finance, commerce, industry, technology, telecommunications, and transportation. Historically, Chicago has made noted contributions to urban planning and zoning standards, including new construction styles, the development of the City Beautiful Movement, and the steel-framed skyscraper. Today, it continues its high standard of innovation by setting 100% RE as the basis for future urban development (even despite the 11 nuclear reactors already in operation in the state of Illinois). 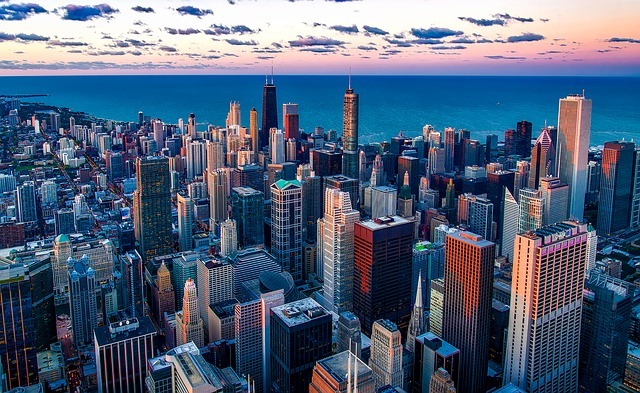 The 100% target is part of the Resilient Chicago plan launched in 2018, which commits the city to transition "to 100% clean, renewable energy in buildings community-wide by 2035”. The plan is bolstered by the Sierra Club’s “Ready for 100” campaign, an environmental action group advocating 100% renewable energy worldwide. The city of Chicago has also set more specific sectoral targets. By 2025, all city government electricity purchases, first established in 2017, must come from 100% renewable sources. By 2040, the entire bus fleet will be electrified. The city is also making a push for community solar by supporting the Illinois Power Agency’s community incentive programs and by incentivizing community solar through voluntary programs, such as the Chicago Renewable Energy Challenge. Since the passage of the Future Energy Jobs Act, Chicago has seen a boom in community solar, with 1.8 GW of projects applying for block grants in just two weeks.